Jack and Kiriana’s New Zealand Rotorua wedding Day After photoshoot was one for the books! Although rain persisted the day after their wedding, Kiriana and Jack could not have been better sports about it. We grabbed a clear umbrella, weathered the storm, and explored some of Rotorua’s best spots! We started our New Zealand Rotorua Wedding Day After Photoshoot with a few small bridges and walkways along Rotorua Lake. We continued around Lake Rotorua to capture Jack and Kiriana on this embankment. “That’s a really hard question to answer. There are lots of things I love about Jack, we have many shared passions. But what I love the most about Jack is his determination and his sense of adventure. 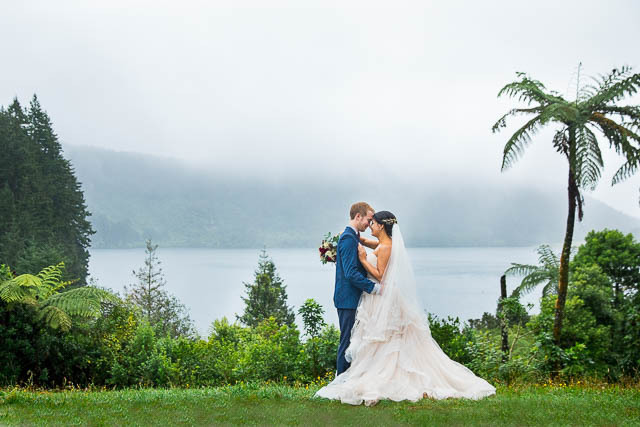 Jack can achieve anything he sets his mind to, and I admire that about him.” Thank you, Jack and Kiriana, for not only trusting me to photograph your Rotorua New Zealand wedding day, but also for rolling with Mother Nature and having FUN with it! I hope to be back in New Zealand soon!